The intrepid travellers of Bryn Lodge No 6553 are now renowned for their globetrotting expeditions as they continue their tradition of annually visiting a lodge in a different country/jurisdiction. The past 18 years have seen them travel to lodges far and wide. Last year, continuing the tercentenary celebrations, and never having made a fraternal visit in the English constitution, a trip to London, Chelsea Lodge No 3098, Tower of London, Goose and Gridiron and all, was a deviation from the norm. Barry Dickinson (left) presents an inscribed gavel, on behalf of the lodge, to the WM with David Ogden looking on. This year they were back on the overseas trail. 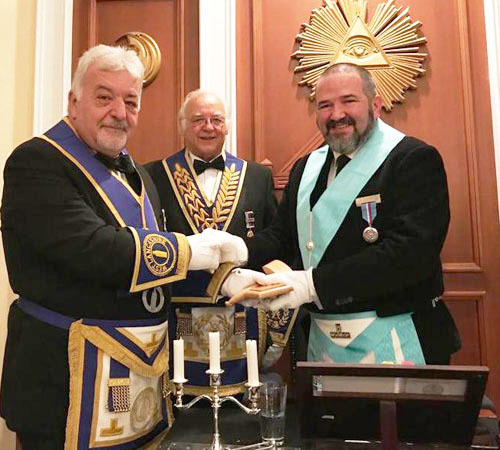 In previous years the team of lodge members visited Ireland, Scotland, Germany, Czech Republic, Spain, Holland (to a lodge working under the Prince Hall Grand Lodge of Massachusetts), Portugal, Majorca, Jersey, Greece, Gibraltar, Bulgaria, Luxembourg, Hungary, Belgium and France. On each occasion, they have visited an English-speaking lodge, and seen many variations of ritual, customs and culture. This year it was to be no different. Slovakia was the destination. Friday morning started with a leisurely breakfast. Even though it was a lunchtime start the lodge was just over the road from the hotel. You could certainly walk past the premises, as the entrance was to an inconspicuous building in the midst of a line of shopfronts. Freemasonry existed from early times in Austria, (remember brother Mozart) until it was made illegal by Emperor Franz II in 1794. The workaround was to practice in nearby Bratislava (then called Pressberg). Freemasonry thrived (one lodge had over 700 members) until the effects of World War II are considered. German Nazism destroyed or confiscated almost everything related to Freemasonry — books, tools, documents. Later, in February 1948, the Communists took power. The few remaining traces of Freemasonry disappeared under the communist steamroller. These two totalitarian regimes persecuted its members and intimidated its sympathizers. In addition, they slandered Freemasonry with the enormous force of their propaganda. It was not until 1991 that the lodges saw light, and one of them, Kosmopolis No 2 was the host for this fraternal visit. Pictured left: The brethren enjoying the good food, beer and great company. Pictured right: The Masonic Hall in Bratislava. The visitors received a very warm welcome. Inside was a lovely lodge room, and the brethren were processed in and introduced, as is the local custom, in a formal manner, following the opening of the lodge. The proceedings were conducted half in English, and half in Slovak, and although there was a partial language difference, it was easy to follow. Following tradition, and the Bryn WM being unable to attend, Barry Dickinson presented the WM with an engraved gavel as a memento of the visit and in recognition of the lodge facilitating yet another overseas visit by Bryn Lodge. It was then a trip into the old town for a festive board in the cellar of a local restaurant, with great food, wine and the friendly companionship of the hosts. Saturday and Sunday were left for city tram tours, a bit of rifle shooting, site seeing, and enjoying the fine cuisine, wine and beer the city had to offer. An uneventful flight saw everyone safely home in the early hours of Monday morning. What a fabulous weekend. And next year? The intrepid travellers from Bryn in the grand lodge temple with officers from Kosmopolis Lodge.